Gleaning is an ancient practice, as old as the Torah. It means to gather leftover grain or other produce from farm fields after a harvest, and traditionally was a form of charity. In most places, the tradition has died out. But today on Martha's Vineyard thanks to a program called Island Grown Gleaning, it's alive and well. 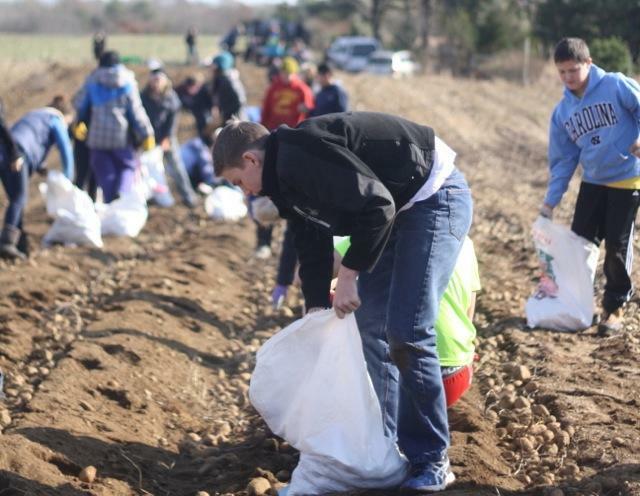 This week on the Local Food Report, Elspeth Hay attends a potato glean with a group of eighth graders from West Tisbury. You can learn more about Island Grown Gleaning and their parent organization Island Grown Initiative on their website. And you can see more pictures of the kids in action on Elspeth's blog, Diary of a Locavore. Spelt is an ancient grain—a hybrid of regular bread wheat and another wheat variety called farro or emmer. This week on the Local Food Report, Elspeth Hay talks with Ed Miller of Wellfleet about a slow-rise spelt bread made with locally grown grain. The bean to bar chocolate movement is on the rise. This week on the Local Food Report, Elspeth Hay talks with a young couple in Truro who've opened a chocolate factory. She learns about sourcing beans, how the production process works, and what characteristics make for a top notch chocolate bar. You can find a recipe for a chocolate bundt cake and see photos from Chequessett Chocolate's factory on Elspeth's blog, Diary of a Locavore.